Jack, yes that's his name is two years old we got him from a Rescue. He had been loved and cared for, but he lived with an older Staffie, as Jack was young and wanted to play the Staffie was getting older and did not want to play so he used to fight with Jack. Jacks owners thought it best that Jack was rehomed where he could be himself. Jack was only in a foster home for 2 weeks before we saw him on a web site, we fell for him. So he now lives with Hubby and I. He is such a super little chap, and he already new his manners and lots of tricks. 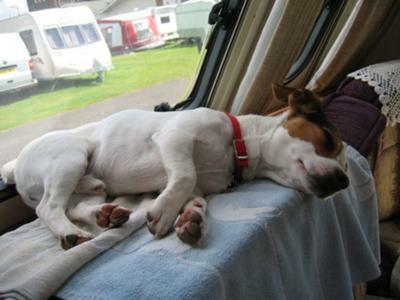 This is Jack on Holiday in the Caravan which he loves.